“Calvet was a disciple of Belgian violinist and composer, Guillaume Remy a Massart First Prize pupil (1878), and contemporary of Ysaÿe in Liège. Upon graduating in 1919, Calvet formed an ensemble specialising in Beethoven Quartets, with violinist Georges Mignot, violist Léon Pascal and cellist Paul Mas. It was, however, only in 1928, coincidentally ahead of the death of the admired – yet intimidating – Lucien Capet, that Calvet felt they could accept an invitation by ‘music life coach’ Nadia Boulanger to perform a complete cycle of Beethoven quartets. And it was in the 1930s, with Daniel Guilevitch on 2nd violin, that they made celebrated recordings of Beethoven, Debussy and Ravel quartets, and the Quintet by Florent Schmitt. 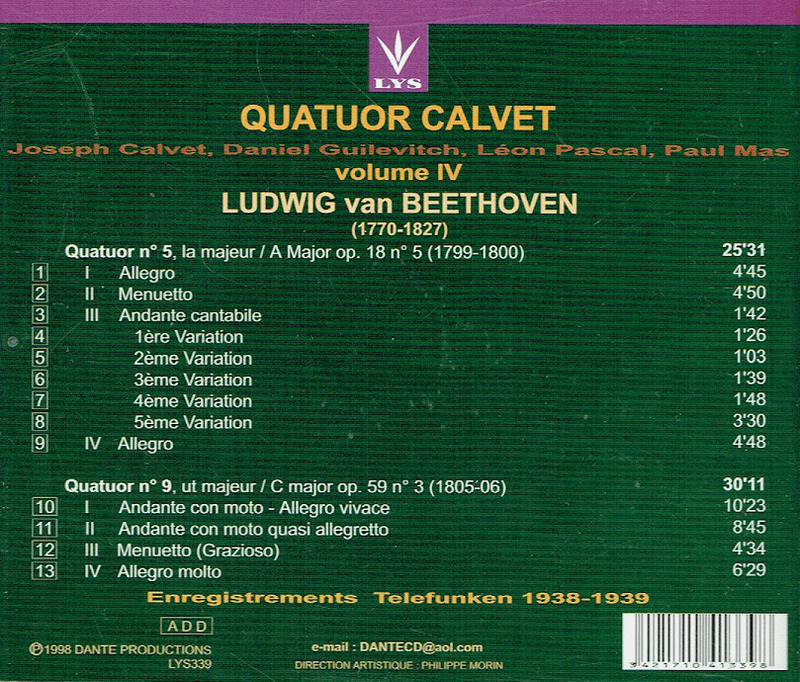 At the approach of WWII, Quatuor Calvet disbanded, as 2nd violin Daniel Guilevitch fled the Nazis to the USA. Shortening his name to Daniel Guilet, he became concertmaster in Toscanini’s NBC Symphony Orchestra, and later founded the long-lived Beaux Arts Trio (1954-2008) with Casals-trained cellist Bernard Greenhouse and pianist Menahem Pressler. 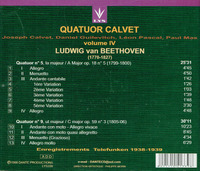 Calvet’s violist Léon Pascal formed the Pascal Quartet which enjoyed an enviable post-War reputation, not only in Beethoven, but also through an expanded range of recordings in the 1950s. Still regarded as the world’s foremost quartet between 1930-1950 - along with Belgium’s Pro Arte Quartet - many composers dedicated works to them, including Vincent d’Indy, Marcel Delannoy, Jean Françaix, Florent Schmitt, Henri Sauget, Reynaldo Hahn and Guy Ropartz. 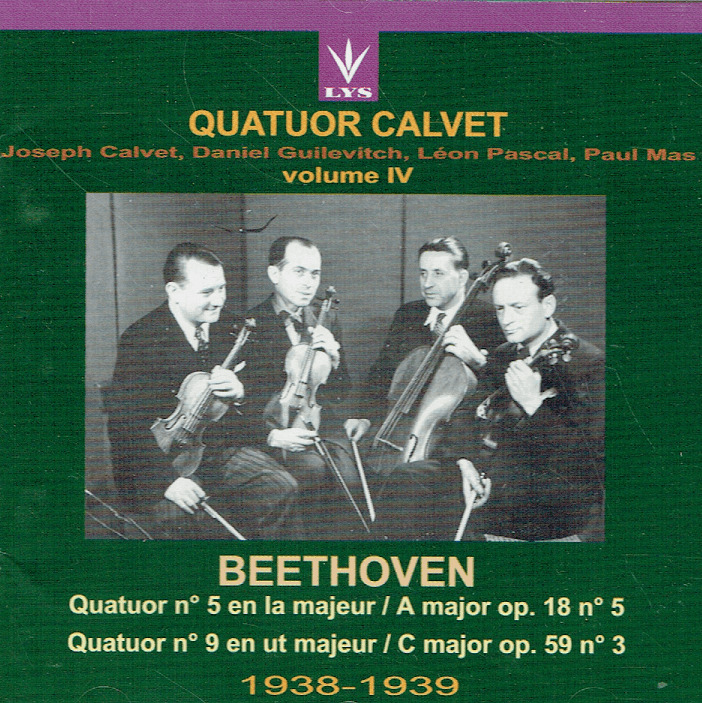 Calvet’s temporary ill-health forced the quartet to break up definitively in 1950, with remaining members regrouping as Quatuor Champeil, and continuing to produce high level performances and recordings.